Each Welsh cookie is approximately 3 3/4" in diameter, 3/8" thick and 1 ounce in weight. They are lightly sweetened and contain pure vegetable shortening and all natural ingredients. Each dozen has just over 1/2 oz. of milk and less than 1/2 egg. They have a shelf life of 16 weeks. 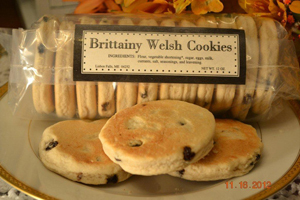 The original Brittainy Welsh Cookies - Our original Welsh Cookies (otherwise known as welsh cakes or welsh miners cakes) are frequently labeled 'addictive'. Each cookie is loaded with currants, and memorably flavored with pure vanilla and nutmeg. 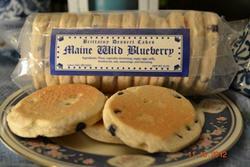 Maine Wild Blueberry - A delectable combination of flavors. A cross between homemade blueberry pancakes and a high quality shortbread. Maine Wild Blueberry Dessert Cakes are a unique product with an unforgetable taste. 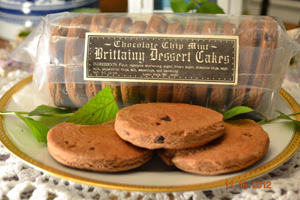 Chocolate Chip Mint - Just the right amount of peppermint, and chocolate coupled with the delicate texture of our original Welsh cakes These lightly sweetened cookies melt in your mouth. HoliDaze - The essence of holiday baking all wrapped up in one. Our delicate combination of dried cranberries and white raisins, laced together with the flavors of cinnamon and allspice. The taste will put you back in grandma's kitchen. Our welsh cookie company has been in business for over 20 years providing product to a national market. 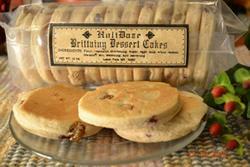 Although our recipe is based on an original welsh cookie recipe, our cookies are light, cakey and full of flavor. Unlike other cookies or desserts, ours are lightly sweetened. They are a unique food product that you will love to eat, and be confident giving as a gift. Shop our online store today!